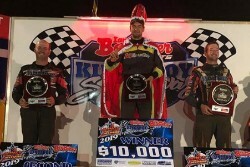 Three times and current Queensland Champion, Aidan Raymont has won an action packed, Kings Royal for Modified Sedans at the Ian Boettcher Race Parts, Kingaroy Speedway on Sunday night, before a near capacity crowd. After thirty five heat races, ten dashes, and pole shuffles, Aidan Raymont and Western Australian, Clint Noakes would start on the front row for the $10000 to win, fifty lap main event. Noakes would get the best of the start and would lead Raymont through the early laps, followed by Victorians, Kye Walters and Brock Atkins. Ty Galley and Tim Smith were early casualties in a race which went for more than forty five minutes. Brock Atkins moved to third on lap ten, in what was quite the spectacle with twenty two cars still on track. That number would soon diminish, with former National Champion, Greg Worling, Wayne Gilroy, Tim Weir, Brett Barron, Gary Pagel and Matty Smith all making their way to the infield for various incidents, all within the space of three laps. Atkins would be the next retiree on lap eighteen, as the casualty toll mounted. Noakes meanwhile was still in the lead, holding off Aidan Raymont, Walters and Shane MacDonald who had started out of position twelve. Kye Walters would also find himself on the infield while in third place, and soon after Raymont took the lead from Noakes, who lasted one further lap before he too joined a growing list on non finishers after breaking a control arm, with the whole front left suspension falling off the car. Raymont drove away from the opposition in the concluding stages, with Shane and Nathan MacDonald finishing second and third, both meritorious drives, with Nathan coming from the B Main. The minor placings of Brodie Boss, Johnno Collins, Dennis Shallcross, Michael Shelford, Andrew Blackwell and Jason Beer were not finalised until the chequered flag, with just two seconds separating the six. The National Title to be held at the same venue later in the season, promises to be one not to miss based on the last three nights of competition.